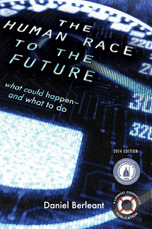 The Lifeboat Foundation has published its first book, “The Human Race to the Future: What Could Happen — and What to Do”. May 14, 2013 — The Lifeboat Foundation has published its first book, "The Human Race to the Future: What Could Happen — and What to Do" whose Kindle version has already reached #8 in Amazon's Nonfiction > Science category. The book is available in both paperback and Kindle version. Who doesn't wonder about the future… what things will be like some day, how long it might take, and what we can do about it? This book gives possible answers, spanning from the current century to nearly eternity. Imaginative yet scientifically plausible, most chapters offer a concluding section discussing actions to take in view of the predicted future scenarios. Some of these actions can be done by individuals, others by nations or other groups, and still others by the entire world. Find out What it Means That an Hour’s Work Yields a Week’s Food in chapter 1. Foresee the Teeming Cities of Mars (chap. 21). Learn why it’s Keyboards Yesterday, Mind Reading Tomorrow (chap. 3). Have you wondered — Will Artificial Intelligence Threaten Civilization? (See chap. 12.) What happens When Genomes Get Cheap (chap. 6). Prepare for an Asteroid Apocalypse (chap. 25). Why you would benefit from Wiki-wiki-wikipedia (chap. 4). How we will Live Anywhere, Work Anywhere Else (chap. 2). How the future Tastes Like the Singularity (chap. 15). Get smarter with Smart Pills’n Such (chap. 5). Experience a Soylent Spring (chap. 9). Understand nukes better by Deconstructing Nonproliferation (chap. 13). Get ready for a Space Empire (chap. 14). There’s global warming, and there’s Warm, Poison Planet (chap. 17). But let’s not forget about Big Ice (chap. 22). Things may really grow on trees with New Plant Paradigms (chap. 24). What is Sic Transit Humanitas: The Transcent of Man (chap. 26)? We all have Questions (chap. 31). And much more! This book is for you if you are interested in the future, intrigued by science and technology, or both. Read and enjoy.